I am passionate about the study of Scripture! Simply put, I’m a diehard PC guy. I use a Dell Alienware M17x Laptop running Windows 7. I love the machine. The two things I love most about it, (besides reliability) are the 17″ high res screen (1920 x 1200) and the integrated keypad on the full sized keyboard. I crunch a lot of numbers and run a lot of applications at one time. I need a business class workhorse and I found one! At both of my workstations (in my office as well as my home) I have two high res 22″ flat screen LCD monitor to run in conjunction with the laptop. It’s a great writing and studying tool! This is the core of my study library. I use Logos Scholars Portfolio Edition every day! 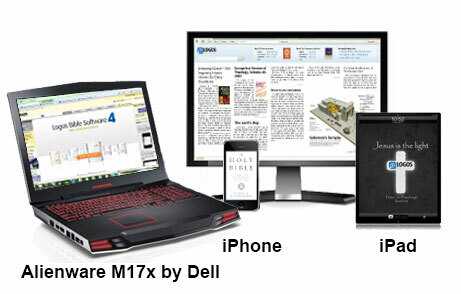 Click here for a demo of the best Bible study sofware on the planet. With more than 1600 titles in the Platinumn Portfolio plus over 2,10 additional books, (Over the last nine years my theoligical library has grown to over 6,170 books!) this is a Bible lover’s dream come true! The beauty of Logos is that I can search the whole library in seconds on almost any level I want, from Bible verses, Greek or Hebrew words, to phrases, thoughts and subjects. Logos Bible Software is robust enough for seasoned pastors and scholars, but accessible to Bible students of all levels. With its powerful, intuitive tools, Logos Bible Software 4 gets me into the Word. Whether I’m preparing my next sermon, FaceBook or blog post, seeking answers to questions that constantly come to me, or having daily devotional time, Logos Bible Software is the tool for the task. Additionally, like printed books, I can use highlighters and pens as well as take notes……and unlike my printed book library, all the open books and Bibles syncronize as I move from book to book. I can highlight text on my iPad in a book or take notes……AND…….within minutes the same books on my iPone and computer are highlighted through Logos’ own cloud technology. WOW! What I love most is that thousands of books are available to purchase separately……from Spurgon to N.T. Wright! Click on the box to see all the great features and books included in the Scholar’s Library Platinum edition. There are nine collections to choose from based on your Bible study needs ranging in price from $294.00-$4900.00. Click here to see a comparison chart of the books included in the nine collections of Logos. Oh yeah, the good news is that it is also available for the Mac AND……….the coolest iPhone app that will allow access on your iPhone to many of the books already in your collection! The beauty of Logos Bible software is that my study library of over 1500 books is designed to run-on and sync-between all my computers, including my iPad! It remembers your favorite resources, bookmarks, and settings across all platforms. Logos even saves your last location in each of your books, so you can leave your desk and pick up your reading right where you left off using your iPhone or iPad. 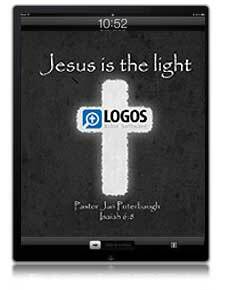 The beauty of Logos on the iPone as well as the iPad (and of course the laptop) is that you and search fast, you can enter a verse and get a detailed report that includes relevant commentaries, cross references, literary typing, and media resources. You can access the original Greek & Hebrew words with a simple tap-and-hold on any word in the Bible. You can read any of the books in your library. 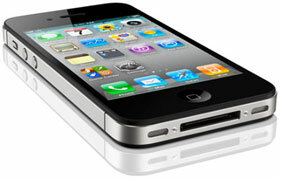 If you’ve opened the book before on your iPhone or computer, it will pick up right where you left off. you can gGet a report with links to dictionaries, lexicons, verses using any word in Scripture, and view various translations of the Greek or Hebrew word. Looking up Greek or Hebrew words in a lexicon allows you to get a definition of the Greek or Hebrew word and its various uses in Scripture. Whew! And there is more! This little guy is a Pastor’s best friend! Organization and communication are so important to keep sane in this busy world. This little baby syncs my contacts, email, calendar and more with my laptop so that I am always in the zone and on top of my busy schedule. Access to over 30 Bibles and with registration, access to another 30+ titles, including Bible dictionaries, devotionals, topical Bibles, original Greek New Testament’s, systematic theology, commentary and many other books. The great thing about the social networking site Facebook is that the only people who can see your activity is friends that you allow in. A large population of our church family is on FaceBook. We share encouragment, prayers, and life together. It’s a great way to stay connected throughout the week. We also use Facebook to post event invites, videos of baptisms, pictures of LifePoint events and more. On a personal note, I stay connected with friends and family in other states and have found friends from over twenty years past that I worked with and went to school with. Ther are many more that I use daily: The iPhone Calendar, email, camera, video and GPS apps, Franklin Covey’s “Goals” app as well as their “Task” app. The list just goes on and on!